Specsavers in Buttercrane Shopping Centre held a spinathon in store on Wednesday 19 August in aid of PIPS Newry and Mourne, the store’s charity for this year, raising £320. 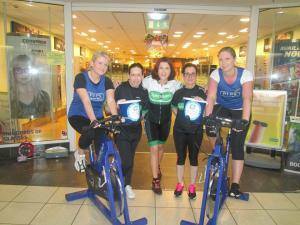 Alison Dunne, Director of Specsavers Newry, said: 'The spinathon was the latest event we’ve held in aid of PIPS this year and it was well supported by our staff, with almost 30 members taking part, as well as our customers. Seven staff from Specsavers Newry and their families also took part in the 2015 PIPS Newry 5k walk held on Sunday 6 September. PIPS Newry and Mourne would like to thank Specsavers and congratulate everyone for another great event. in picture Cathy Coffey, Joanne Sheehan, Alison Dunne, Sandra McAvoy and Shauna Reeves at the spin event.